​A fun filled 2 hour creative experience where you get to create a beautiful colourful Christmas Bauble for your tree. All supplies included Cost $35 pp. ​A wonderful 2 hour workshop. Exploring paper and paint to create an individual piece of art. Cost $50 pp all supplies included (except frame). 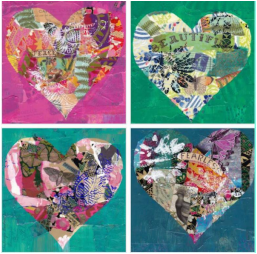 A 2 hour workshop creating a single heart to reflect your inner wisdom. Paper, paint and collage all work together on a canvas for you to hang your very own individual art work. $55 all supplies included. "Bec Schopen you are a genius. Emilia absolutely loved her art class today"
"Last week I attended a mixed media workshop with Bec Schopen. Other than being a fabulously caring & kind person, she creates the most beautiful artwork that I have admired for years. With her brush strokes & use of colour she can elicit such an array of emotions. It is something I find so daunting but comes so naturally to her. I listen to her speak so passionately about colour & tone, about finding inspiration in the everyday & I can relate to these aspects of her craft".